1 prints of the crew agreement- to your self. A home return flight ticket. It would be a good idea to bring different credit cards fx VISA and Mastercard. The following list is only an idea for you. You don’t have to bring it all if you not think it is necessary. Clothes: Choose only close you feel comfortable in. T-Shirts and Shorts / Dresses– Not too many, there is limited space. From experience 4-5 pieces are more than enouth. Bathing suits – There will be plenty of time to swim. 1 Long-sleeved sweater / hoodie-For the cold evenings. Lightweight / loose blouse / shirt – to protect you from the sun. 1 windproof jacket – You are probably travel with a jacket when you fly. Shoes: Most of the time we are barefoot on the boat. Special sailing/deck shoes – we do not wear shoes on board that are used ashore. If you need to wear shoes they MUST have a white sole and must not be used ashore. Lightweight collapsible bag/rucksack – there is no storage space for solid sided luggage. Sun-protection screen – the sun is strong at sea and the water reflects the sun rays. Seasickness pills – there can be rough weather at times. Hat – protect your head. Sunglasses – protect your eyes. Beach towel – for use off the boat. Lifejackets and safety harness- is available onboard. Do not pack clothes for each day of a month. It will be possible to wash along the way. Solid sided luggage or any non collapsible wheeled bags. 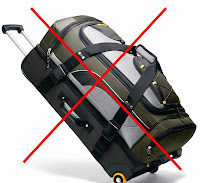 Storage space is very limited in the cabins so if your empty luggage cannot be rolled up and stored in the bottom of the hanging locker, then you have to throw it away.